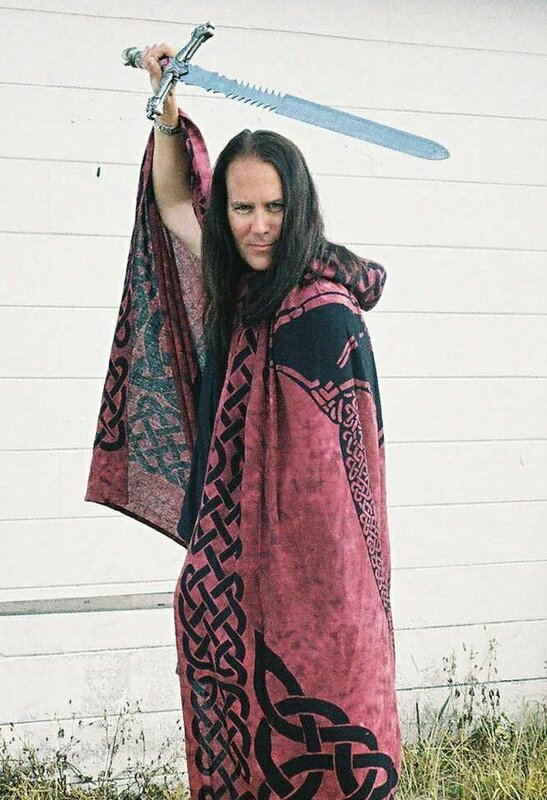 They don't call Minnesota gubernatorial candidate Jonathon Sharkey "The Impaler" for nothing: a self-described "Satanic Dark Priest, Sanguinarian Vampyre and a Hecate Witch" with the "Magikal Path" name of "Lord Area," he is a "strong believer and supporter of Impalement for terrorists and criminals." The operator of two covens, a disabled army vet, and a former pro wrestler and boxer, Sharkey's platform includes an opposition to war, more support for education and veterans' services, religious freedom (naturally), boot camp for juvenile offenders, a blacklist of American companies that relocate offshore and, yes, impalement of terrorists (among others). The best part: Sharkey is running for president, so he can take impalement national. The impaler launches his gubernatorial campaign in Princeton, Minnesota, tomorrow, Friday the 13th. Jonathon Sharkey, the Vampyres, Witches and Pagans Party candidate for governor of Minnesota, in an e-mail to the Politics1.com blog, after a post mistakenly identified him as a "Wiccan Dark Priest"
"The owner of two covens, a disabled army vet, and a former pro wrestler and boxer..."
Upon first reading, I thought you meant he owned a disabled army vet! Regardless, he seems an interesting character. I emailed him when I saw on his website that he has a Ph.D. I see on your page http://www.jonathonforgovernor.us/Home_page.html that you have a Ph.D, but I don't see listed on your bio page where you did your doctoral work. Where did you do your Ph.D, and what was the topic of your dissertation? SCU my dis was about the fact judges who are elected by the people are no different than any other politician. They can be bought! When did you get your Ph.D? And can you clarify SCU? elected) are less culpable of corruption? Southern Christian University - in Lake Charles, LA. Some Judges are corrupt no matter if they are elecetd or not. Cause they are puppets of their partys. I did it through correspondence courses. My number is in NJ. I am not really sure if the school is 'approved' or credit. I enjoyed the courses, and I passed all my examines. Whether or not the school is accredited, truly doesn't matter to. I completed the required studies and I am very proud of it! Apparently if you get your Ph.D. by correspondence, they just waive that whole "spelling" requirement. Jonathon “The Impaler” Sharkey, who announced in Princeton Jan. 13 that he was running for governor, was arrested at his Princeton apartment about 8:30 Monday evening. Princeton officer Todd Frederick initiated a search yesterday afternoon that led to the discovery of two active felony warrants from Marion County (Indianapolis)?in Indiana. What a freak. Implaing people. what good would that do. Fear is a terrible thing to install in people and if that's his campaign strategy then GOD be with him. I was researching realpresidential candidates and came across this guy. He is, or has been, investigated by the Secret Service, for his plan to "impale King George Bush" as he calls him. He also refers to the Secret Service as The Secret Squirrels. Maybe it's my very real and accredited degree in Sociology, and I just love a weirdo, but I am fascinated by the idea of some one so deluded running for president. I'm writing about him (and some other freak candidates for my blog). May I quote you on this subject? If you wish to have the skinny on some of jonathans other up comming problems email me.